Connect and engage with parents and families in a more personalized and effective way with Edlio's parent engagement app, Sangha. Your whole staff will use Sangha for sending announcements, alerting everyone in urgent situations, planning sign-up events, scheduling parent-teacher meetings and messaging parents. Admins love that everything is fully transparent, with all teachers using the same platform for easy auditing, and has earned FERPA and California Student Data Privacy Certifications. Teachers love getting permission slips and class messages out reliably to families, with responses taking minutes rather than days. And parents love that they're not getting large amounts of communication from multiple channels that doesn't relate to their kids. Edlio and Sangha customers: Use your School's Edlio login page to access Sangha. 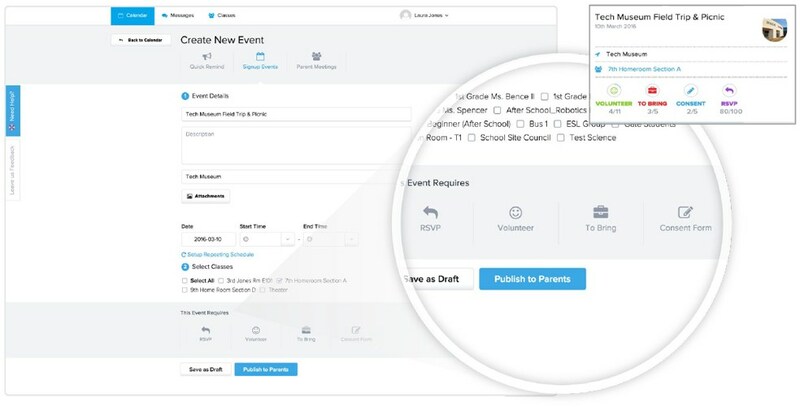 Administrators, teachers and organizers can create and manage events with automatic RSVP tracking, integrated forms and e-signatures, volunteering and material donation requests, and payments, fundraising and selling items/tickets. Administrators, teachers and organizers create and manage events and messages using a single school web app. Parents receive only the information relevant to their children in a format they can act upon, right from their phone or e-mail. Administrators, teachers and organizers track and manage parent responses from within the school app. Sangha reinvents the way a school or district connects, informs and interacts with parents. Information is highly personalized for each student. Because 80% of school-home communications are associated with a date or deadline, Sangha’s calendar architecture aligns content creation and school communications in a way that’s truly actionable for parents and saves time for teachers and school organizers by allowing the most time intensive tasks to be automated. Parents can immediately view published events in the mobile app and can respond to requests with a single tap. 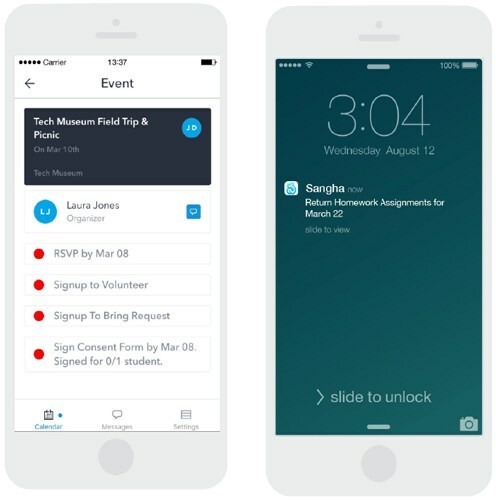 Sangha automatically reminds parents of the event via the mobile app and email newsletters. Scheduling parent-teacher meetings is typically a very time consuming process for teachers and parents, requiring hours of effort over weeks and months of planning. Sangha automates parent-teacher meetings by providing an online and mobile reservation system that leverages Sangha’s ability to connect and engage the entire school community electronically. With just a few clicks, teachers or organizers can create a customized reservation schedule for parent-teacher meetings and can track and manage parent responses from within the Sangha app. Parents receive notification and can reserve available times from their phone or a web browser. Organizers can also sign up on behalf of offline parents. Sangha supports secure private messaging between administrators, teacher, organizers and parents. Sangha private messages are two-way, enabling school staff and parents to have extended private discussions supported by thoughtful features that make secure messaging even more productive. Consolidating multiple channels for event and messaging apps not only saves time and money -- school/district administrators enjoy the peace of mind with complete oversight of all communication in Sangha's enterprise-class solution. All admins and teachers use the same interface with permissions granted by school administration. Admins have access to a school-wide view of all classes, groups and related parents, while teachers have a simpler classroom view to communicate with only parents of their students. See it for yourself. Use the form below or call (877) 646-0500 to get pricing information and to book a demo with a team member.